Will your class escape in time? Uh oh! 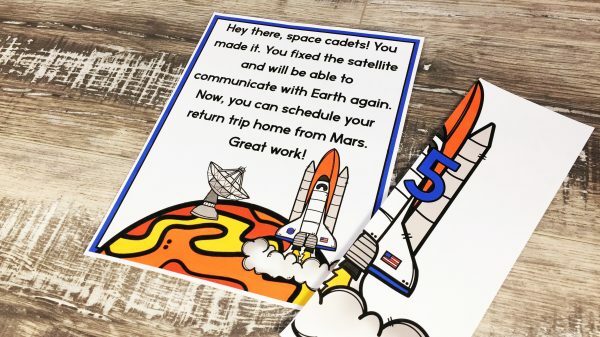 Your students are stuck on Mars! Their satellite is broken, and they must fix it to communicate with Earth and return home. 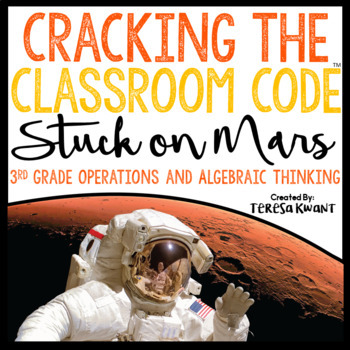 Students will try and breakout from their risky situation by solving a string of math problems and clues. This is a review game for the math concepts taught in 3rd grade under the domain of operations and algebraic thinking. It can be played in small groups, or as a whole class. If your class has never played an escape game before, I suggest playing as a whole class for the first time. This is an interactive game where the students are timed. Students try and solve clues and math problems to breakout and escape the classroom. You, the teacher, can decide how much time your students have to complete the task. I will suggest 45 minutes, but it is up to your discretion. You can project a timer for your class, or put one somewhere for all the students to see, so they can keep track of how much time they have left to complete their task. *Interpreting products of whole numbers. *Using multiplication and division within 100. *Determine the unknown number in a multiplication or division problem. *Applying properties of operations to multiply and divide. My students just love to use these to review skills! Thank you! Great resource! There are a lot of steps to putting it together but they were clearly explained to make the process go smoothly. Nice details! My students loved solving this activity. Love these activities. Some set up is required but worth it. The pirate version was so fun that I had to buy this one as well. Awesome resource! I bought this to play with my summer school class. It looks like a great review of all things space! Thank You! This was my second cracking the classroom code! I really love this resource, it’s so worth the time and effort in putting it together! It’s also easy to differentiate. I printed multiple copies on different colored papers and allowed some students to work in a group, some with a partner, and a few individually. So excited to try this with my class! Great review! My students had a great time with this math game. Thank you for the detailed explanation of how to use the item. Can’t wait to use this in my classroom. Directions were easy to follow, but more importantly my students LOVED it! Lots of set-up work to do, but the kids love it! My students LOVED this wonderful activity! They are begging to do more. Crack the Classroom Code really stretched my students in very important ways. They began to use their math skills in a practical way that increased their critical thinking!! Excellent product!! Students need a little introduction to game first. Loved it. This was a fun activity for the kids! Kept them engaged in the activity. Look forward to purchasing more. Super fun and engaging. The kids loved it (I loved it); I will definitely be doing some more of these. This is a very intriguing way to get kids to practice their facts. I can’t wait to see how my class responds. I really had to reread the directions for putting this activity together, but I think I’ve got it now! This was a nicely designed product and I’m going to try it next time with small groups of students. It didn’t really work for me as a whole group activity with my students. My students really enjoyed this! It was a little difficult to cut everything out and put it on the envelopes. The directions were very clear and easy to follow. It turned out fantastic and the kids LOVED this. Thank you! My enrichment students loved this!! It takes some preparation time, but the kids love it. An amazing resource! We tried it as a whole class first and then in groups. My students loved it. My students loved this! They can’t wait to do more! Thank you! Can’t wait to do this with my students! Great way to end a unit! This looks amazing – I am hoping it will engage all levels in my 3rd grade classroom. We will try this one whole group, and hopefully be back for more. Thank You! So excited to use this before winter break! My students really enjoy these games. They are very challenged! Can’t wait to use this. My students loved the Thanksgiving one! So much fun and challenging ! Can’t wait to use this with my students! Loved the first one I bought and this one looks like it is the same organized and quality product! I am excited to use this as a review before our Unit Test. I’m worried about the preparation of it, and making sure all pieces are correctly placed, but I think my students will really enjoy the background story and challenge! My third graders LOVED this activity! The directions are well written and easy to follow! You’ll have a lot of fun with this resource! We did this as a review and my students loved it!! They were very engaged and loved trying to solve the clues! 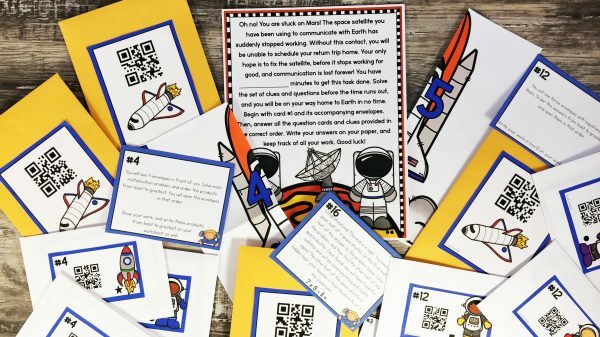 Great resource for science projects! My third graders loved ‘cracking the code’! Thanks! Love this! I’m excited to use this! Buy the bundle, the kids are sure to love them! Very easy to put together with the instructions provided. Thanks! We had SO much fun with this yesterday!! Thank you! I did this with my class this week and the kids LOVED it!!! The instructions on how to put it all together were very clear and simple to follow. It took a little while to get the envelopes set up but it was time well spent. GREAT product!!! Fun and easy. I purchased all three of your breakouts. Love them! worked perfectly. The students really enjoyed this activity! Thanks! I did this whole group to show my students the expectations for another one similar to this! Loved it! They love it. 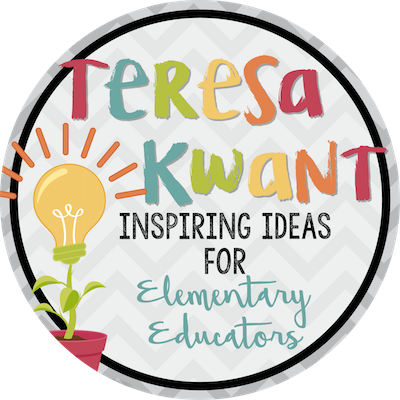 This is quite possibly the most engaging activity I’ve purchased this school year from TpT. Thank you! This will be so much fun for my students during our testing week! Thank you!! Great activity! I was wondering if you could make a version where we could edit the questions for our weaker students? I’m so excited to use this with our solar system unit. This was a wonderful resource! Thank you! Had to grab this! What fun!